Follow the adventures of the Wallies and meet Doctor Quincy DeQuincey. A love triangle develops between a smart disaffected working-class husband Jimmy, his reserved upper-middle-class wife Alison and her arrogant best friend Helena. I loved this when I saw it when it was first aired. I had then never heard of Emma Thompson Hugh Laurie or Stephen Fry. I now still think of them as Ezzer, Huzzer and Lord Stezzer. 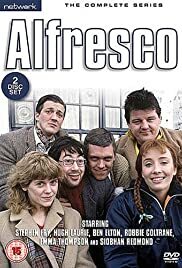 Alfresco sank without trace at the time (I seemed to remember it was aired mid-week and late) and I was therefore delighted to see it released on DVD. It is just as funny as I remember. I know some others do not like it, but comedy is such a personal thing. I am not easily pleased by comedy sketches. All I can say is I watched a couple of episodes randomly yesterday with my husband and teenage daughter and we all literally cried with laughter. All the principals (also Robbie Coltrane, Ben Elton-who did most of the writing- and Siobhan Redmond) were excellent, but Emma Thompson's ability to take on a character is up there with Peter Sellers. Brilliant!